The Choir were delighted that their Musical Director – Erfyl Owen(Bov) won this year’s Cân i Gymru competition on S4C. Even more Pleasing for the Owen family was that the song was sung by the group ‘Ceidwad y Gan’ with Bov’s son Hari being the lead singer. This song is now on the choir’s repertoire and is very popular with our audiences. This year, S4C received 114 songs for the competition – the highest number to compete for some years.The songs of the Cân i Gymru (Song for Wales) competition where reduced to a short list of eight which were performed live on S4C on 1 March at Theatr Bryn Terfel, Pontio, Bangor, with the presenters Elin Fflur and Trystan Ellis Morris at the helm. Llongyfarchiadau mawr i ti Bov ar cyrraedd y ffeinal o Cân i Gymru efo dy gân Cofio Hedd Wyn. It was nice to meet up again with Howard Hughes(Spud) who, with his wife Chris, was on a brief visit from Perth, Australia. Howard was the eldest son of Peter Hughes Pant-y-Blodau who was the main instigator in getting the County Council to allow the two Ty-Isa fields to be used as a Playing Field. Howard is a member of three choirs in Perth and had a few hints for the choir when he attended one of their practices recently. Irwel (Pen-y-Graig) reckons that Howard was one of the best footballers to play for village team even better than himself and Dei ‘Beau’ Williams. Alan Jones, Rhydonnen Farm who lives in the Llanynys parish. The choir wish a speedy recovery to Elwyn Roberts following his illness. Friday 20th September – St Mary’s Church, Broughton. The Choir has been in existence for 7 years(nearly to the day) and their very first concert was at the Club when they only knew 3 songs which they sang twice to stretch the evening. This will be their fifth concert at the Club and members of the choir are looking forward to it. 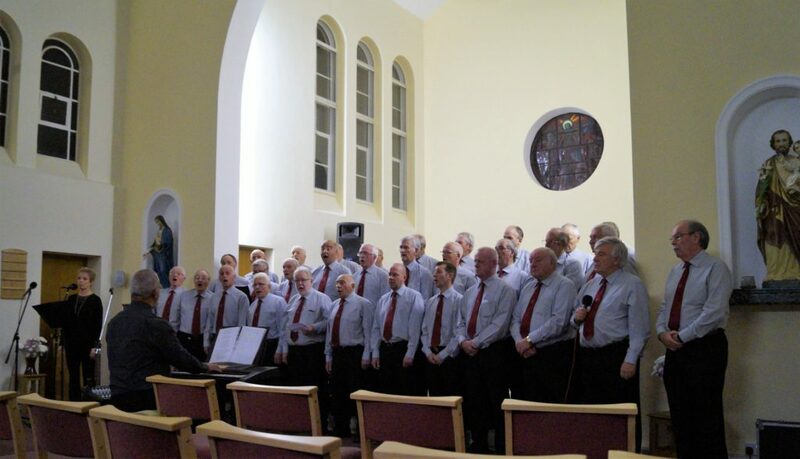 The Choir have been invited to do a concert to raise funds for the running of the above Association which does a fantastic job in providing Sports facilities for the inhabitants of Ruthin and its surrounding area. The Concert will be held in the Association’s Pavilion on the Parc-y-Dre Playing Field – entrance at the back of the Fire Station. Sunday June 10th – ‘Dechrau canu dechrau canmol’ – Llanfair TH church. The Choir were delighted to be invited, for the 5th time, to sing at the 2018 Ruthin Flower Show. The audience were very appreciative of the Choir’s performance and once again the Choir enjoyed singing in the Auction Hall amongst the show exhibits. Concert at the Highways Chapel, Ewloe for Christian Aid – August 31st The choir thoroughly enjoyed singing at this beautiful Chapel in Ewloe. There was a good turnout of Choir and Audience which helped with the atmosphere and the Chapel’s fine acoustics made it a very enjoyable evening for all. Also thanks to the Ladies of the Chapel for an excellent supper. On Friday September 14th the first of the two concerts to raise money for next year’s National Urdd Eisteddfod at Denbigh. The main star is Alejandro Jones from Patagonia, South Argentina and his ancestors were part of the Welsh settlers in the 19th century. He has been doing a grand Tour of Wales and this gig is his final one before he returns home. He has a lovely voice and he is hoping that many of the choir (and audience)will join him in a good old fashion Welsh sing song. Cyngerdd yn Theatre John Ambrose Ysgol Brynhyfryd – Hydref 6ed – Cymdeithas Cymraeg Rhuthun The Choir were delighted to be invited to open the Welsh society’s programme for the Winter events; the concert was followed by a very nice supper – Thank you Ladies. Cyngerdd yn Neuadd Pwllglas – Hydref 13eg. 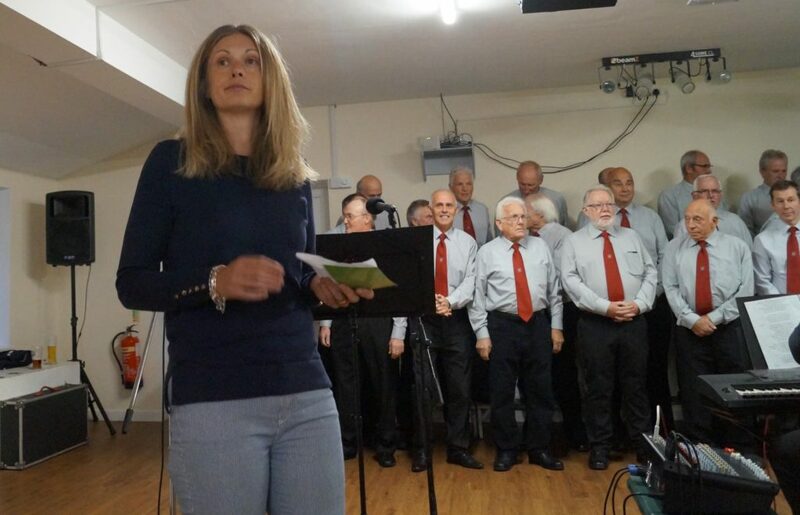 Luned Yaxley organised a fund Raiser concert on behalf of Ty Gobaith – it was well supported in Pwllglas Village Hall. Once again a delicious supper was provided for the Choir. Cyngerdd yn Capel Jerusalem, Cerrigydrudion – Hydref 21fed. Dyma y tro cyntaf i’r Côr canu yn Cerrigydrudion a cafwyd croeso mawr gen y gynulleidfa. Unwaith eto cafwyd swper blasus gen merched y Capel. 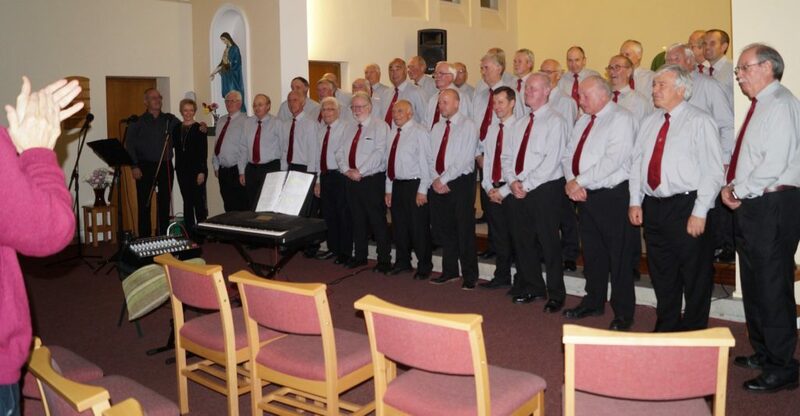 Concert in St Augustine’s Priory Old Colwyn for the British Heart Foundation on October 24th. What a lovely location this was with the Church and the rest of the building in superb condition. The Choir appreciated a hot cuppa before and during the Concert finishing the evening with a nice supper. The audience obviously appreciated the Choir efforts during the evening as they gave a standing ovation at the end of a lovely evening. and a standing ovation at the end……. Following this concert the choir have been invited to sing in Northern Ireland next year – start saving boys.